I'm willing to bet ​you've had your fair share of trying to brush out the thick mats on your poodle. Being a professional ​pet groomer I often meet frustrated owners who continually brush their Poodle or Doodle-mix, only to have them full of mats again and eventually forced to have their ​pup shaved completely. The key is having the right tools and technique so you can avoid mats, shave downs, or expensive grooms. So here's a few grooming shop secrets, my personal pick of tools, and some helpful tips to keep your ​Poodle/Doodle looking beautiful and tangle free. ​You​ can see exactly why I use these two tools in my full review ​further down. Or just click here to skip ahead. ​What Are The Best Brushes ​To Use? ​One of the first things I look at when a new dog comes into our shop is to check for thick mats or tangles. Depending on the type of haircut the owner wants; I have to inspect to make sure if it's even possible. ​If your Poodle is free of mats it ​will make grooming an absolute ​joy (and cheaper for you). And a little daily maintenance at home using the right tools and techniques will keep your ​pup looking and feeling good. Light matting can be brushed out, often with a little help from some good shampoo and conditioning treatment (which I'll cover in a bit). 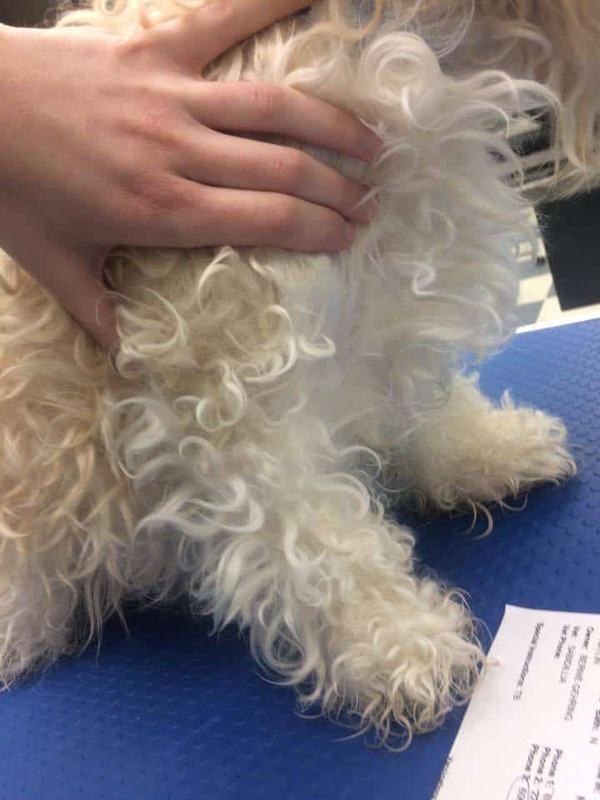 Matted Poodle Mix - I'm unable to separate hairs to see skin underneath. Heavy matting on the front of the legs, behind the ears, and in the armpits is the first thing I look for. Why? Because these are tender spots that are uncomfortable for the dog, and can be very painful to brush out if they're deeply tangled. Also, I look to see if the hair can be easily separated enough to see skin. If I can't separate the hair all the way down, that's another bad sign. If I see these ​problems then there is only one humane option - shave them completely. ​​I know many owners hate having to do this (if they prefer longer coats), but as groomers and dog owners we have to think of their comfort​ first. ​So in order to solve this dilemma, owners must not only ​comb out the surface hair, but get right down deep to find all those hidden tangles, ​before they turn into painful mats. ​Those thick beautiful curls need our daily attention or they'll turn into a beautiful disaster. We'll make use of a slicker, a greyhound comb, and some ​easy grooming tricks to keep them tangle free. ​If your dog is matted, try giving them a bath first, use a fair amount of detangling pet conditioner and let it work it's magic for several minutes before rinsing. Towel dry​, but leave them slightly damp. Now that those tangles are a little looser, brushing them out will be easier. Use a good slicker ​daily, and use it to ​work through their entire coat. Do not go over the same spot more than 3 times (unless you have a slicker with bendable pins) - you'll irritate their skin and cause brush burn. Always brush with the growth of hair (not against it), be very gentle around sensitive areas such as the armpits or behind the ears. Now use a greyhound comb and glide through their coat, looking for any mats you may have missed, especially those deep tangles closer to their skin. If you bathed them prior - use a dryer on cool (while gently combing) to blow out any remaining coat and dry before those curls contract and create more mats. ​Does Shampoo and Conditioner Help? You absolutely must rinse off all the shampoo and conditioner when you're done, and you have to brush them out afterwards. What tends to happen is any soap or shampoos that do not get rinsed will clump at the hair roots, causing even more mats and a very difficult groom. That being said, if rinsed out properly these products will certainly leave your canine's coat feeling soft, and can make grooming a whole lot easier. Going for a swim or a bath can actually wreak havoc on a curly coat that isn't properly brushed afterwards. Those tight curls will expand when exposed to water, and then tighten again when dried - leading to some heavy-duty matting. After a bath or swim towel dry your Doodle, and brush them out while they're still a bit damp. When those curls tighten again they won't interlink and cause impossible tangles. Brushing everyday (especially after playtime or bath time) is important, but having good tools will make all the difference. If you're still using that pin brush from the dollar store - you're in for some long and difficult ​grooming sessions. You'll need a good slicker. 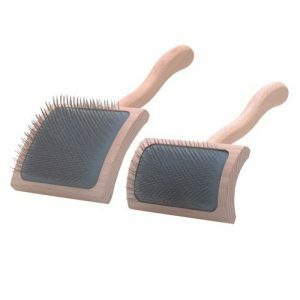 ​These are simply a brush that's dense with very thin (but strong) bendable pins. Having hundreds of pins close together works at separating hairs, which demats your dog as ​you comb through their coat. Higher end slickers have very flexible and smooth pins. ​As you brush your dog the pins bend back, easing up on the applied pressure and stopping them from irritating your ​canine's skin. The handle needs to be comfortable to hold. When you ​groom ​pets for living like I do, it makes a BIG difference. Also you'll need something that is durable and won't break when it's inevitably dropped. I know it's tempting to try a cheap version, but it's better in the long run to get good tools. Why? Because the pins on cheap brushes will be stiff and sharp which hurts your dog, the handle will break, and the bristles will wear out in no time. You’ll actually save money buying one good ​tool over a dozen cheaply made ones. Make sure you ​pup is 100% mat free with a simple and very cheap tool. In comes the Greyhound Comb to save the day. Gently glide through their coat to "seek and destroy" any of those hidden mats the slicker couldn't quite reach. I​ groom Doodles/Poodles of all shapes and sizes every single day, I've worked with everything from rescue dogs to show dogs. So here are my personal weapons of choice. A good slicker ​will make ​grooming easy and comfortable for your Poodle/Doodle. 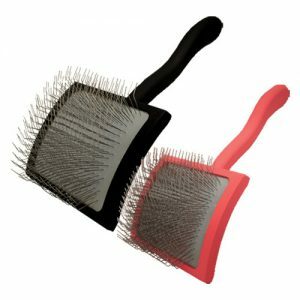 The fine bristles will penetrate into their coat and detangle most of the surface hair, while removing dirt, and debris. The #1 issue with nearly all the brushes on the market is brush burn. While you ​work through their coat the sharp pins will irritate your dog's sensitive skin. So you'll need a properly engineered tool that is designed to make grooming comfortable. Also​, this ​grooming tool needs to be dense with pins, so that each pin spreads hair apart and easily dematts as you brush. So here I've listed the best slickers that are designed to avoid brush burn, and maximize dematting. ​​Expensive. That being said, it's the best brush on the market, and the last one you'll ever buy. The A5III slicker is typically a more affordable version of the first recommendation, but while missing a few features. There's less flexibility in the pins, so be aware of brush burn and don't go over the same spot more than 3 times. Also, the pin density is slightly lower, but still effective at de-matting. ​​Good pin density, used for separating hairs and making dematting easier. ​​​Pins don't bend as much, which may lead to brush burn. Do not brush any part of your dog more than 3 times. Pin density is slightly lower, but still good. ​I call this my "seek and destroy" tool, I glide through their coat with the long pinned greyhound comb to find any hidden mats. 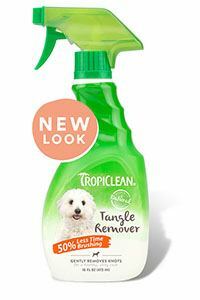 It's perfect for finishing your dog and making sure they're 100% clear and free of tangles. 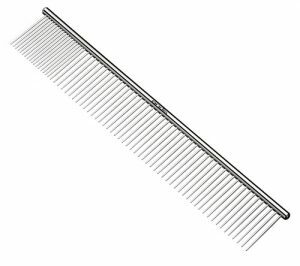 ​There are a million replicas of this exact comb, but I prefer using Andis because the pins are stronger and ​the tips are softened to avoid hurting your dog. The long pins reach deep into their coat, unhinging any hidden tangles near the surface of the skin. An absolute must-​have for grooming thick coats. Quick tool for finishing touches. ​​​​These break down over time, and comb needles get bent. Thankfully, it's cheap to replace. ​If you want to give your dog a full groom at home (and potentially save some money), then check out my full list of the ﻿best ​clippers for poodles and labradoodles. ​Finally, you can use some detangling shampoos or sprays to assist you in your dematting. They do make a big difference, especially for those ​pups who love to roll around and play (I'm looking at you, every single Labradoodle). ​W​orks good for light to medium mat​s. May not help with heavy or extreme mats. The detangler works best after a bath, use a generous amount of detangler spray and let it soak for 10 minutes before grooming. Awesome Information!!!!!! Best info I have found!! Thank you so, so very much!! We have a new puppy and an 11 month old. Both F1 goldendoodles. We are going to attempt grooming them ourselves. This was most helpful. I have two cockapoos and try to do most of grooming myself. What blades do you recommend for grooming doodles? I have a Oster A5 clipper and Inam getting a Sproodle!